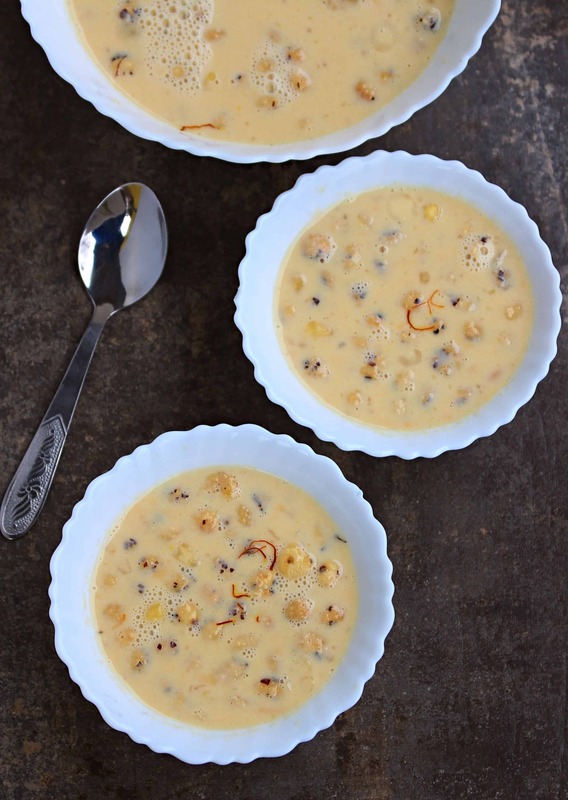 A delicious kheer / pudding made with Makhana / Fox nut / Lotus seed. This is perfect for the festival season and for fasting months. 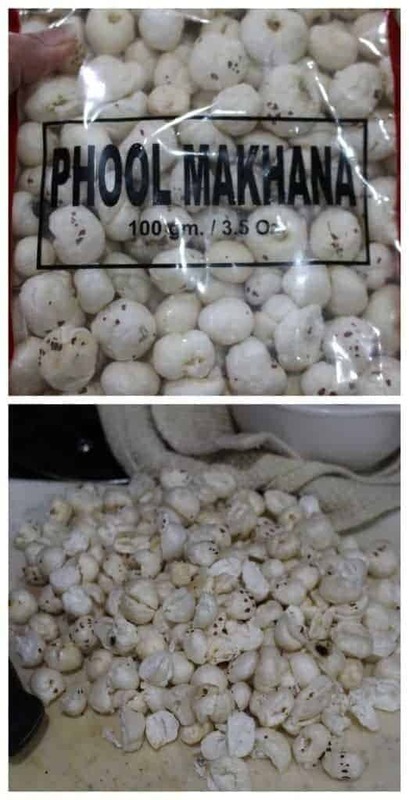 Phool Makhana / Fox nut / Lotus seeds – I have heard a lot about this but never got a chance to make anything with it. 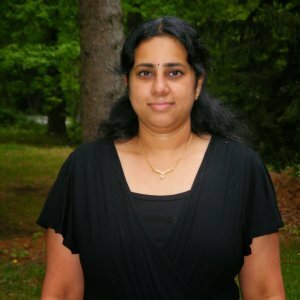 Last month, I bought a pack of it from my local Indian stores and was planning to make a savory snack with it. 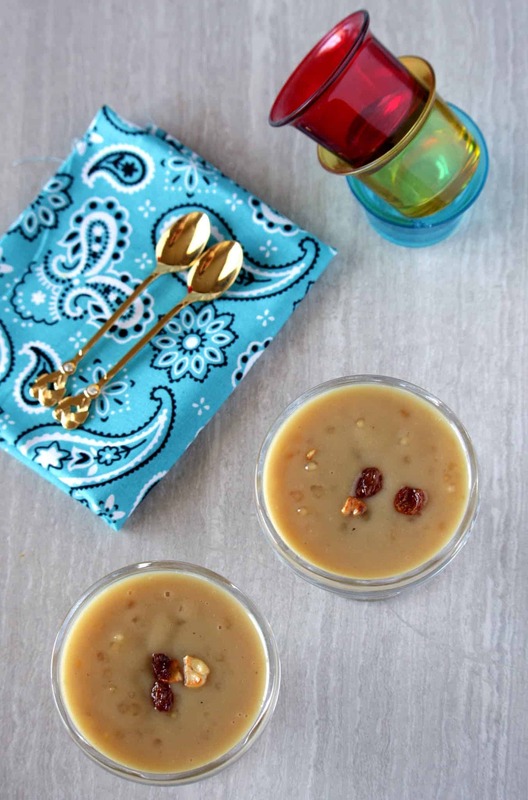 This week I am making festival recipes and that is when I thought about using the lotus seeds to make this delicious Makhane ki Kheer | Phool Makhana Kheer | Fox Nut Pudding. 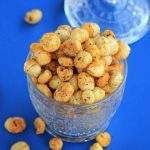 Makhana / fox nut has protein, potassium, phosphorus, carbohydrates, fiber, magnesium, iron and zinc. All this makes it a best snack option. Makhana by itself has no flavor or taste, but can easily take up any flavor that it is cooked with. There are different ways, how everyone makes their Makhana kheer. Some grind a part of it to thicken the milk mixture and some add it whole. I chopped the makhana in half and used it. 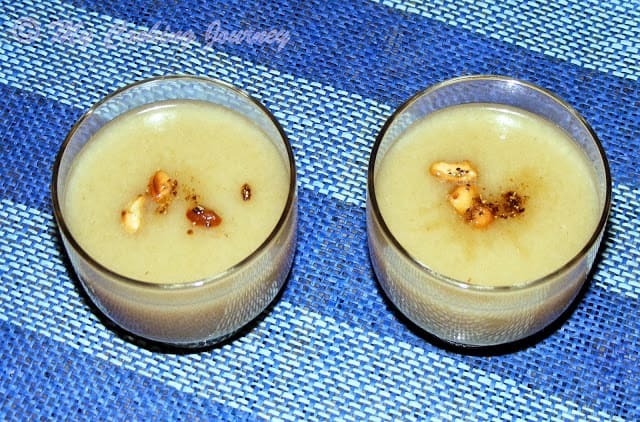 I also ground a few almonds and used it to flavor the kheer. The boys loved the chewy texture of the makhana pieces in the kheer and the almonds, cardamom and saffron really flavored the kheer. 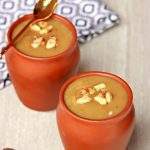 Measure the makhana / fox nut and chop it into halves or quarters. I just chopped them in halves. 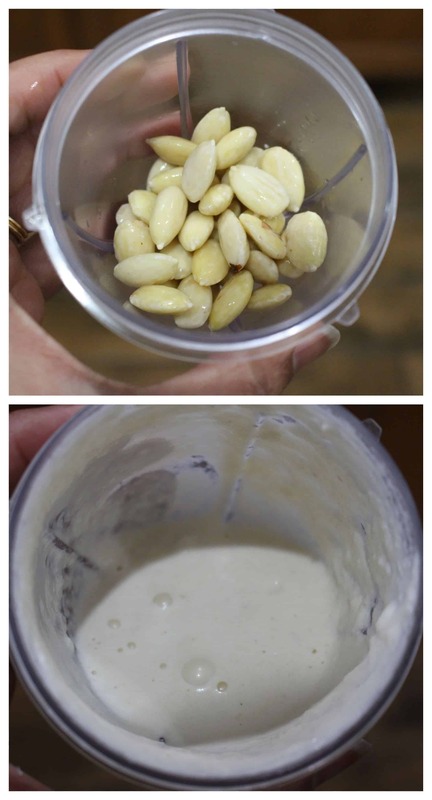 Soak the almonds in hot water for 30 minutes and peel it. Add a little water or milk and grind the almonds into a smooth paste. 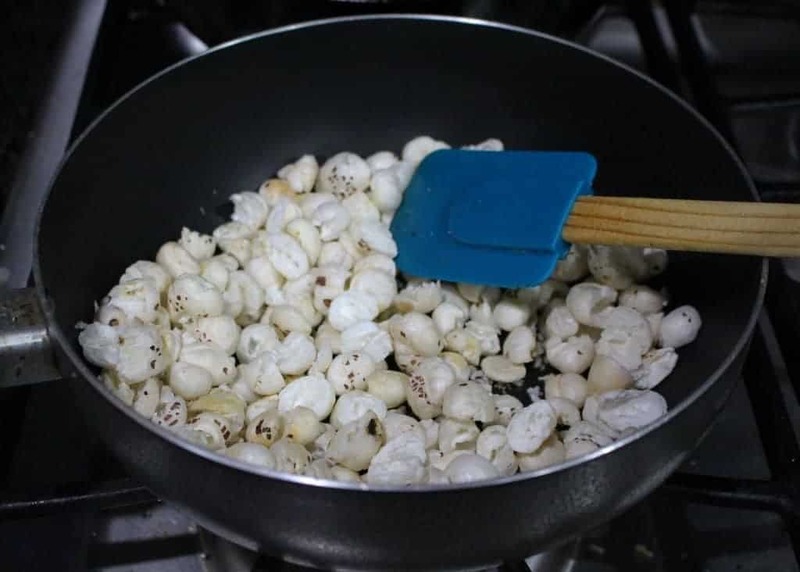 Heat the ghee in a pan and add the chopped fox nut. Roast them in low flame until they are light brown. This happens very quickly and hence make sure that you roast it in low flame. 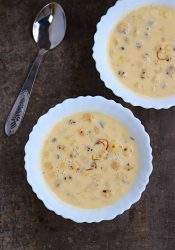 Remove the roasted fox nut / makhana in a plate and in the same pan, measure the milk and add the evaporated milk to it. Also add the ground almond paste to the milk and bring it to a boil. 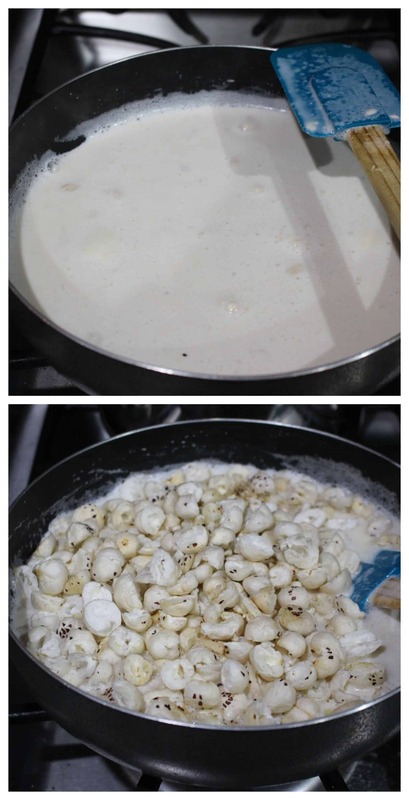 Simmer the heat and let the milk mixture reduce a bit to make it condensed and flavorful. Add the sugar to the milk and mix well to dissolve. 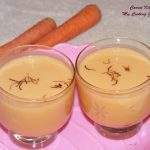 Now add the roasted makhana to the milk and continue to cook until the makhanas soften and the milk condenses further. Add the cardamom powder and saffron threads and mix well. Remove from heat and serve warm or chilled! 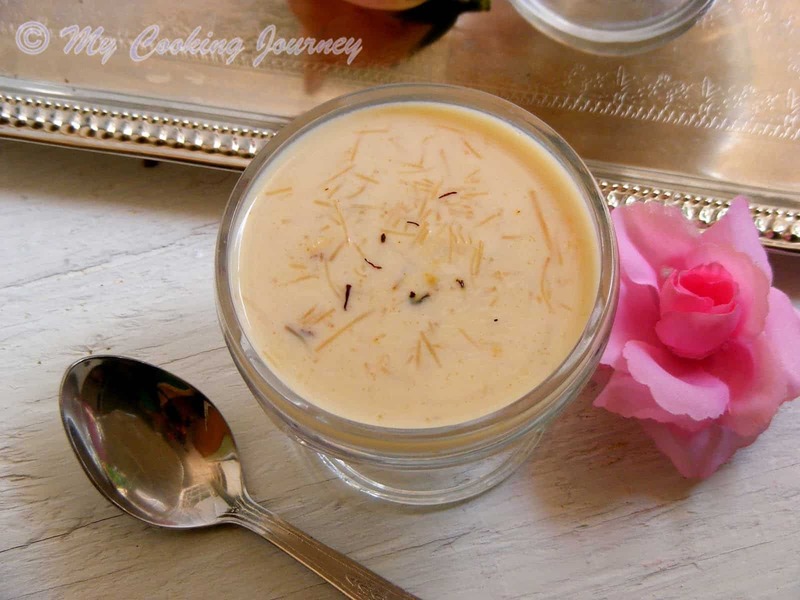 Evaporated milk and almond paste must have made the makhana kheer super rich and decadent. Love the rich color of the sweet. Cant take my eyes from those bowl of incredibly delicious kheer, have tried makhana kheer but yours sounds simply fabulous. Feel like having a bowl rite now. Kheer looks sinful. 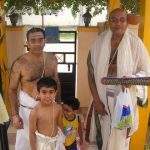 It is one of my favourite. 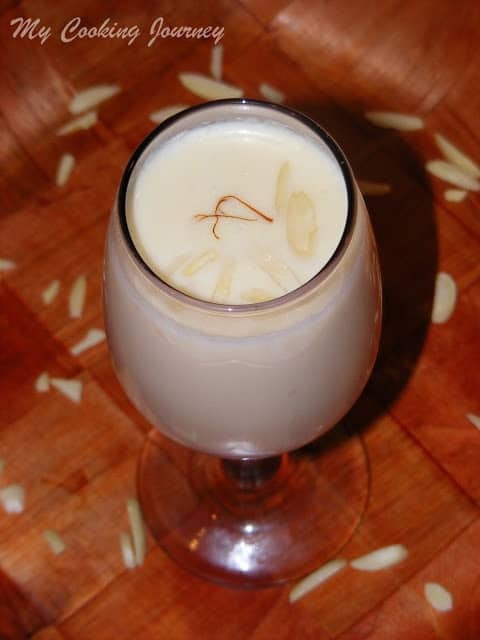 Adding of almond paste must have added to the richness of the kheer. 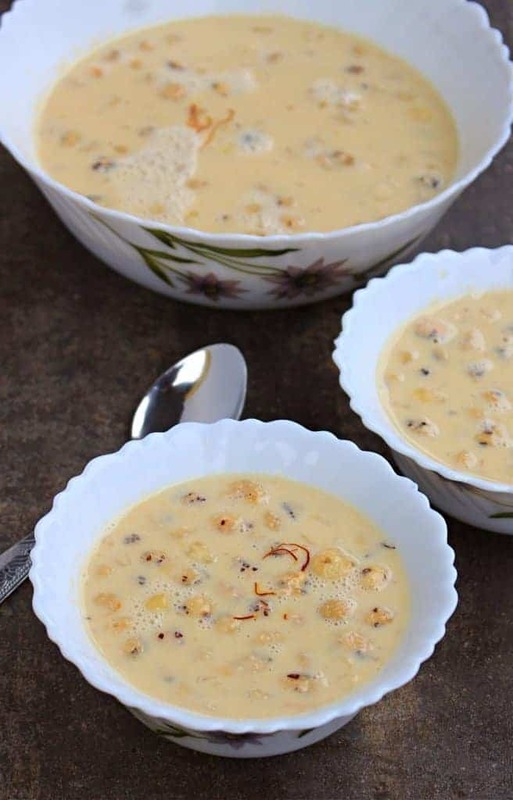 I somehow haven’t tried this kheer yet. 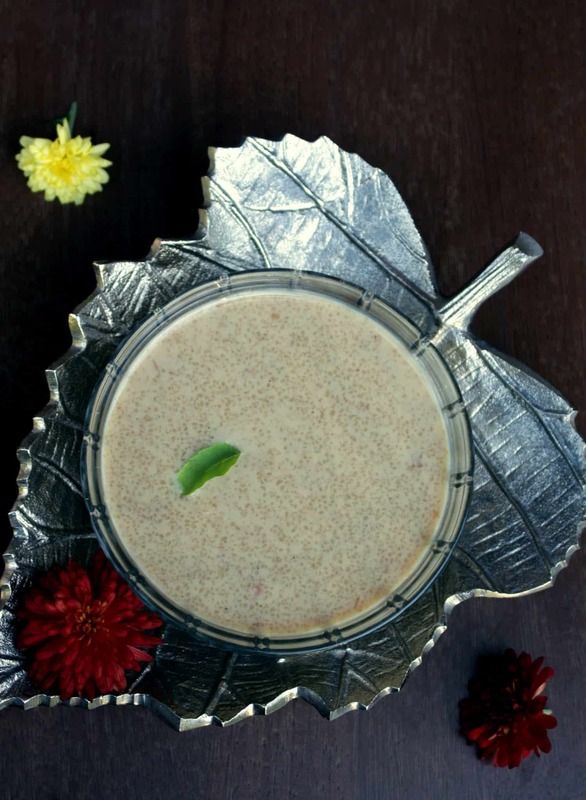 the almonds and the evaporated milk add a rich base and I bet this was one yummy kheer. 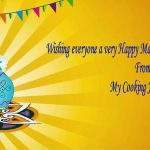 I have not used phool makhana in my kitchen. The pudding pics look amazing. Must try try this dish soon.